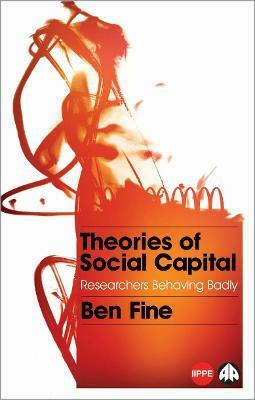 Tracing the evolution of social capital since his highly acclaimed contribution of 2001 (Social Capital Versus Social Theory), Ben Fine consolidates his position as the world's leading critic of the concept. Fine forcibly demonstrates how social capital has expanded across the social sciences only by degrading the different disciplines and topics that it touches: a McDonaldisation of social theory. The rise and fall of social capital at the World Bank is critically explained as is social capital's growing presence in disciplines, such as management studies, and its relative absence in others, such as social history. Writing with a sharp critical edge, Fine not only deconstructs the roller-coaster presence of social capital across the social sciences but also draws out lessons on how (and how not) to do research. Ben Fine is Professor of Economics at SOAS, University of London. He is the author of the critical texts, Macroeconomics and Microeconomics (Pluto, 2016), co-author of Marx's 'Capital' (Pluto, 2016) and co-editor of Beyond the Developmental State (Pluto, 2013). He was awarded both the Deutscher and Myrdal Prizes in 2009.